Hollywood's obsession with the demonic and supernatural could have some diabolical consequences. For months, movie marquees all over the country have been hawking a ghastly array of lurid motion pictures featuring Satan and his demonic cohorts. Films such as The Omen, House of Exorcism, The Devil Within Her, God Told Me To, and others have enjoyed immense popularity among the theater-going public. And there's much more to come. The motion picture industry is busily preparing a hideous assortment of devil movies to satisfy the demand - and cash in on the profits. Twentieth Century Fox plans three sequels to its recent hit The Omen. Warner Brothers is putting the final touches on The Heretic, its sequel to The Exorcist. 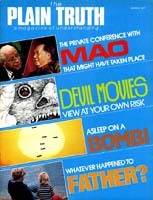 Universal, MCA, American International Pictures, and other studios each have a number of devil flicks in the mill. Your neighborhood theater will soon be screening The Sentinel, Resurrection, The Car (about a demon possessed automobile!) and other imitations of imitations for your "viewing pleasure." The current rash of devil movies was triggered by the 1974 hit The Exorcist, though perhaps Rosemary's Baby (1968) was the first of the genre. Quick to spot a winning theme, the imitative motion picture studios - having beaten the "disaster" motif to death - jumped on the bandwagon and began churning out devil flicks as fast as scripts could be written and casts assembled. The more lurid and gruesome, the better. And who can blame the studios? The supernatural forces of evil are dynamite at the box office. Warner's The Exorcist - possibly the highest- grossing movie of all time - is expected to bring in, all told, over $120 million worldwide. Fox's The Omen, costing less than $3 million to make, has already grossed nearly $50 million at the box office in the United States alone, and that figure may double after the overseas receipts are raked in. Critics reprove the motion picture industry for its creative impoverishment and penchant for imitation, but in the end it's the movie-going public - flocking back to theaters in record numbers which is ultimately to blame for the continuing outpouring of demonic celluloid. But why are today's devil movies so popular, and so lucrative? As with the old, not nearly as lucrative, vampire and werewolf films of decades past, there is still a desire on the part of moviegoers to be scared, to be held in suspense, to receive a jolt. And, as some psychologists have suggested, today's graphic devil flicks may appeal to people's voyeuristic impulses. Many come into the theater hoping for something gruesome or bloody to happen. But there is still another, more significant factor contributing to the popularity of today's devil movies. Studies reveal that popular interest in mysticism, witchcraft, Satanism, psychic phenomena and the occult is greater now than ever before. Disenchanted with traditional religion, people of all ages are becoming increasingly curious about the mysteries of the supernatural. And Hollywood is capitalizing on that interest. Frankenstein Meets Wolfman was never taken seriously. The Mummy, in many cases, triggered more laughs than shrieks. Viewers of these old monster flicks knew for certain that what they were seeing was not real, and sensed that the makers of the films were cranking their cameras with tongue in cheek. But audience reaction to today's devil movies is markedly different. Viewers, in many cases, are taking them very seriously. Interviews with patrons leaving the theater leave little doubt about the films' impact. Some are literally terrified, shivering with fright. A few are sick physically, some having actually fainted or thrown up in the theater. Many speak solemnly about the reinforcement of their belief in the supernatural, and demons in particular. Some say they want to study further into the mysteries of the occult and the spirit world. And some, of course, attempt to laugh it off, often unconvincingly. Follow-up studies show that many viewers go home and can't sleep for days or weeks. Many are afraid to be in the dark. Some start hearing "creaky noises" at night. Many have traumatic nightmares. Some temporarily lose their appetites. One man who viewed The Exorcist lost 15 pounds, suffered a stiff neck, and experienced a recurring nightmare in which he attempted to intercede between a blood-lusting vampire and its female victim. Moreover, viewers who may have been disoriented or emotionally unstable in the first place have on occasion totally "freaked out" after seeing one of these films. Some have suffered hallucinations and delusions. Some have begun thinking that they, their mates, or their children were possessed by demons. Some have become uncontrollably violent, morbidly preoccupied, or self-destructive. Dr. James C. Bozzuto, assistant professor of psychiatry at the University of Connecticut (Farmington), has recently drawn attention to an illness he calls cinematic neurosis - "a traumatic shock to the ego produced by viewing a horrifying film." Dr. Bozzuto's first cinematically neurotic patients were provided by The Exorcist, which deals with the demonic possession of a 12-year-old girl named Regan. The vividly brutal, hair-raising portrayal of her possession and subsequent exorcism was simply too much for them to take. Ominously, Dr. Bozzuto expects the syndrome to become more prevalent across the country, given the continuing onslaught of devil movies. Quoted in a recent issue of Science Digest, Dr. Bozzuto warns that The Exorcist and similar films "can produce significant psychiatric impairment, and both the physician and the public should be aware." Psychological problems are not the only potential danger in devil films. At the same time as interest in the "pop religions" of mysticism and occultism is on the rise, large segments of society remain biblically illiterate. For all they know, the pseudo-biblical pretentions of some of these films are pure biblical truth, when in fact they are riddled with biblical inaccuracies, twistings and perversions. The Omen is a case in point. The film, which deals with the birth and early childhood of the so-called "Antichrist," pictures him as the offspring of the bizarre mating of Satan and a female jackal. The boy's birth occurs on June 6 at 6:00 p.m. - an apparent, but inaccurate reference to Revelation 13: 18 – heralded by a comet in the heavens. None of this has any biblical basis. Even the use of the term "Antichrist" is technically in error. It is mistakenly used as another name for the prophesied "Beast" or great military dictator of the book of Revelation. Actually, the term refers not solely to a specific individual but to an anti-Christian spirit or attitude which has been prevalent in the world for nearly two millennia! The apostle John, writing about A.D. 90, said: "…Even now already it is in the world" (I John 4:3). John also shows that many deceivers or antichrists - false ministers perverting the doctrines of Christ - were already at work during his lifetime (II John 7; I John 2: 18). The Omen's three planned sequels will follow the "Antichrist's" growth into manhood and will culminate in a depictment of the prophesied endtime "Battle of Armageddon." Feeling no compunction to be biblically accurate, Hollywood will certainly continue to dish out some bizarre interpretations of prophecy. Some theologians, consequently, have accused the writers and producers of these and similar films of unwittingly playing into the hands of the very devil whose existence they in most cases deny. By perverting and fictionalizing the Bible popularizing a false picture of Satan and his future intentions Hollywood, these critics charge, may be rendering the real "Antichrist" (or Beast) virtually unrecognizable. What more could Satan want than a distorted popular image of his future plans? These charges may indeed be valid, though many theologians themselves are confused on the subject of prophecy. There are much more immediate personal dangers in the devil-movie surge, however, than mere scriptural inaccuracies. Despite the unfounded assertions of "enlightened" modern day psychologists and philosophers, there is a spirit world. There are such things as demons. There is a devil. Satan is called "the god of this world [or age]" (II Cor. 4:4) and "the prince of devils [demons]" (Mark 3:22), who has "deceived the whole world" (Rev. 12:9). He is pictured as "a roaring lion, walking about, seeking whom he may devour" (I Peter 5: 8). Satan's power, however, is limited. He can do only what God allows him to do, as is clearly seen in the book of Job. Hollywood's portrayal of a great conflict between God and Satan - which God, on occasion, loses - is clearly unbiblical. Numerous cases of demonic possession are found in the Scriptures, as well as cases of exorcisms" casting out of demons by the servants of God. In nearly all cases, God's servants (such as Paul in Acts 16) simply rebuked the evil spirit in the name of Jesus Christ, "and he came out in the same hour." The elaborate Latin incantations and arduous "rites of exorcism" depicted in some of the recent films are not based on Scripture. Demonic influence and, in some cases, actual possession still occur -yes, even in our modern, sophisticated world of the twentieth century. Opening one's mind to demonic influence through a preoccupation with occultism and interest in the supernatural is therefore fraught with potential dangers. Nearly 2000 years ago, the apostle Paul admonished: "Have no fellowship with" the unfruitful works of darkness…" (Eph. 5: 11). The apostle James warned: "Submit yourselves therefore to God. Resist the devil, and he will flee from you" (James 4:7). Yet there is precious little resisting in evidence in the world today. People are not guarding the doors to their minds! Our free booklet The Occult Explosion is a must for a complete understanding of this important subject. Find out what really lies behind today's surge in occult interest.